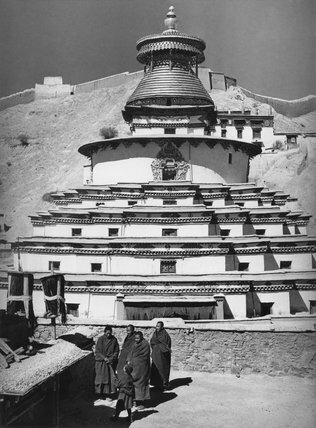 A group of monks, four adults and boy, standing outside the Great chorten at Gyantse, known as the Kumbum. The tiers of the structure dominate the image, rising up to the great finial. The highly decorated window lintels can also be seen. There is a very good view of the metal 'umbrella' at the top of the chorten. In the background, the hills surrounding Gyantse can be seen as well as sections of the town wall on top.